Walk-in tubs enhance safety as you age by allowing you to bathe independently and privately. Because there are tubs with different price points and a variety of comfort and safety features, deciding which one is best for your bathroom can get confusing. Here are a few tips to help you know what you should consider when choosing a walk-in tub. The sealed doors on walk-in tubs help you remain steady as you enter to bathe and ensure water stays contained. While most tubs come with an inward swinging door, outward opening doors are also available. The inward swinging door is most common because the water pressure that forms against the door helps to keep it sealed to avoid moisture on the floor. 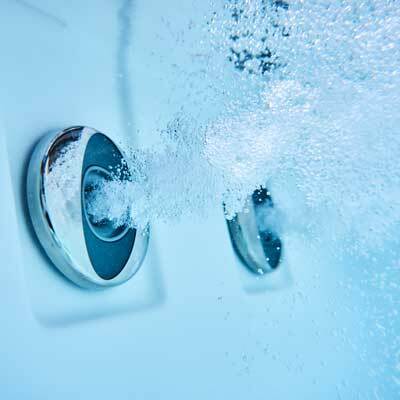 While this type of entry is easier for the bather to open and close, it’s impossible to open in an emergency without draining the tub first. An outward swinging walk-in tub door has a latching mechanism to make it watertight. While these doors open quickly in an emergency without having to drain the entire bath, the door handle can be difficult for someone with limited hand strength to use. The bathroom has to be wide enough to accommodate the door, and these models are more expensive compared to walk-in tubs with an inward opening door. Some models have an extra-wide door to simplify transferring the bather to and from a wheelchair, and many tub doors offer either a left or right opening entrance with safety rails on top of the side of the tub. Thresholds beneath the doors aren’t all the same, either. When you are shopping for a walk-in tub, consider the threshold height and be sure you can step over it without tripping. If the threshold height is a concern, ultra-low step-in profiles are available on some models. Walk-in Tub Jets or No Jets? If cost is an issue, you can save by purchasing a basic walk-in tub. This type of tub will have safety bars and most likely a handheld shower sprayer, but no other features. You can safely bath and soak in one of these tubs. If you have osteoarthritis and rheumatoid arthritis, back pain, a knee or hip replacement, fibromyalgia or other neurological conditions, consider your daily pain level. While soaking in a tub helps reduce pain, buying a walk-in tub with whirlpool or air jets offers a higher standard of hydrotherapy with a long list of health benefits like reducing muscle spasms, strengthening weak muscles, increasing joint range of motion, re-educating paralyzed muscles, and improving coordination and circulation. Look for tubs that provide targeted massaging jets for your problem areas, such as the back, legs or feet. Walk-in tubs with therapeutic jets also promote skin exfoliation, so if you have a skin condition, this is something to consider after discussing with your doctor. Medicated or moisturizing lotions tend to be absorbed well after a jetted bath, too. The average bathtub measures 60 feet long and 32 inches wide. Walk-in tubs are manufactured as small as 36-and-one-half inches long and 33 inches wide to models constructed to serve people who weigh more than 250 pounds. Wider tubs are also designed for wheelchair users or to be used with a lift chair. Another consideration is whether the size of the hallways, stairs and doorways in your home will allow installers to carry the tub to the bathroom. If your doors and hallways are very narrow or you have many steps in a narrow staircase, you might have to do a lot of shopping around before deciding on the right walk-in tub for your existing home. There is a chance you may have to consider renovating your house to get the tub in, such as building a new bathroom in a more suitable spot or reconstructing narrow hallways or doorways. Another factor to keep in mind is that the subfloor of the bathroom has to be stable enough to carry the load of the tub. Remember, these tubs hold may more gallons of water compared to a standard bathtub, so the weight filled is substantially higher. Your contractor can check the subfloor to determine if modifications are necessary. 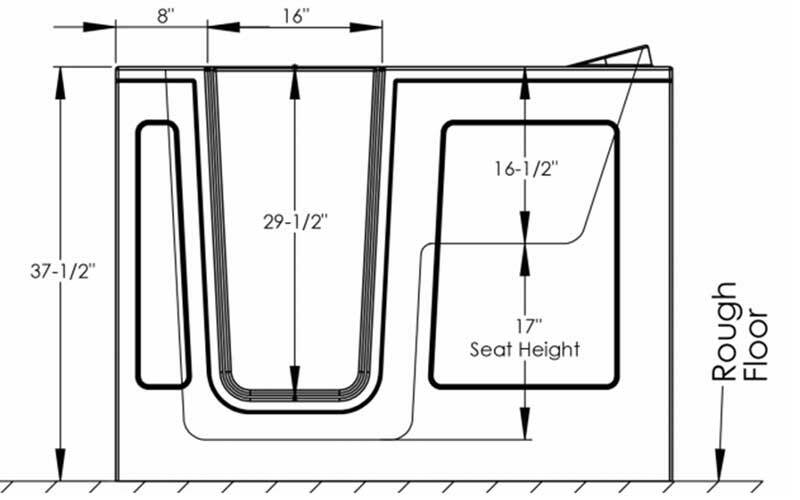 Most walk-in tubs are designed to install where your current tub sits. If you need a walk-in tub that is larger than the existing tub, there will be some additional costs for renovations. If your new walk-in tub is shorter than the old bathtub, extension shelves are an easy fix to compensate for the unneeded space. While walk-in tubs are more expensive than a standard bathtub, it’s best to get a tub that meets your needs both now and in the future. It’s a costly mistake to buy a walk-in tub only to determine you need a different model of tub later because you will pay for installation twice. There a few costs associated with a walk-in tub. Walk-in tubs installation cost from $3,000 to $20,000. These tubs almost always require professional installation, but there are also portable models that are much smaller, may not be sealed to the floor and don’t require the expense of installation. The average cost of installation is between $700 and $1,200, though some companies include installation in their final prices. Another possible cost is a new water heater if your existing heater is too small to adequately heat the water in the new tub, which will add to the overall cost of installing a walk-in tub. Unfortunately, Medicare does not consider these tubs durable medical equipment, so you will have to pay for a walk-in tub on your own. Still, many seniors find that the health and comfort benefits outweigh the cost.